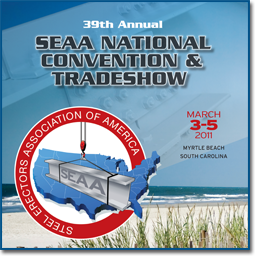 Design Data will exhibit at the Steel Erectors Association of America (SEAA) National Convention and Tradeshow March 3 – 5 in Myrtle Beach, South Carolina. As the leading professional organization dedicated to the advancement of steel erection, this year's event will include more educational and networking opportunities, focusing on how to bring business value to an organization. On March 3, several group outings are scheduled for attendees to participate in – sporting clays/quail hunt, golf and shopping – prior to the evening welcome reception and members networking social. Held at the Kingston Plantation Resort, the tradeshow portion of the event will be held on March 4. Please let your Design Data salesperson know if you plan to attend the show. The concurrent SEAA convention will open on March 4 with a session on how to deal with constant change in the workplace, delivered by Mike Collins, author of The Perfect Workday blog. Collins will also deliver the keynote address on March 5, followed by the SEAA's business meeting. The event concludes with an evening reception and awards ceremony highlighting the best projects of the year.